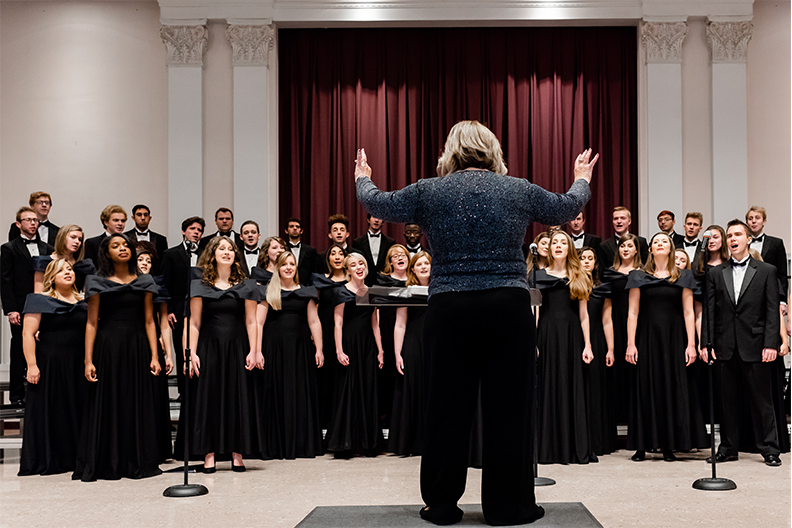 Performing music in a wide range of musical styles, the Elmhurst College choirs will present their Spring Choral Concert on Sunday, April 14. The concert will be the final one for Susan Moninger, who is retiring in June after a distinguished, 30-year career with the College as a music professor and director of choral activities. The concert will feature the Concert Choir, Chamber Singers and Women’s Chorus performing works by Jake Runestad, Randol Bass, Morten Lauridsen, Josqun Des Prez, C.V. Stanford, Giovanni Battista Pergolesi, Stephen Chatman and others, and a world premiere by composer Jonathon Kirk featuring the guest artist group Picosa. Elmhurst’s vocal program has gained a national reputation under Moninger, who joined the College in 1989. She directs the College’s Chamber Singers and Concert Choir. The Elmhurst College Chamber Singers is an auditioned select ensemble that performs madrigal and other forms of challenging Renaissance and Classical literature. The group often shares the holiday spirit by singing for corporations and private events, and has appeared on the NBC, ABC and FOX morning news program. They are featured on a new release due out this spring for Castlevania called Elucard’s Elegy. The Elmhurst College Concert Choir is an auditioned group of students from a variety of majors that sings traditional and contemporary choral music. The choir had the privilege of singing twice with world-renowned tenor Andrea Bocelli as part of his World Tour. The choir also performed in the Emmy-nominated PBS special A Christmas Carol, The Concert. The choir performed at Carnegie Hall in New York recently, and also sang at Symphony Center as part of the Windy City Choral Festival under the direction of Randall Stroope. Recent credits also include performing with the Chicago Pops Orchestra for the Distant Worlds, Final Fantasy Concert at the Rosemont Horizon Theater and recording for the newest Distant Worlds CD with the Stockholm Philharmonic Orchestra. The Elmhurst College Women’s Chorus, directed by Donna Peterson Tallman, is an auditioned select group of women from a variety of majors who sing various styles of literature, including Renaissance, classical and twentieth century. Tallman has held faculty positions in music education at Northern Illinois University and was director of music education at Illinois Benedictine College. The Spring Choral Concert will begin at 2:00 p.m. on Sunday, April 14, in Hammerschmidt Memorial Chapel. The concert is free and open to the public. For more information about music at Elmhurst College, visit the Department of Music or call (630) 617-3515.